Here is the complete collection of stories, image galleries and multimedia files from SPACE.com about shuttle Columbia's STS-107 science research mission from pre-launch through the pre-landing check on Jan. 31, 2003. For SPACE.com's collection of disaster stories, please see this page. Shuttle Columbia is ready to come home. Following 16 days of intense, around-the-clock science research the seven-member Columbia crew on Friday shut down experiments, packed up their gear and ran tests of the systems they'll need for Saturday's planned landing. Shuttle Columbia's astronauts have stars in their eyes. When asked Wednesday to talk about amazing moments during the shuttles 16-day mission, which ends this weekend, Kalpana Chawla described an unusual sight. Shuttle Columbia's orbiting scientists took some time Monday to talk with friends aboard the International Space Station, while mission managers on the ground prepared to recognize an anniversary remembering fallen friends. As shuttle Columbia's 16-day research mission passes the half-way mark, the vast majority of the planned work aboard the orbiting laboratory is getting done despite a persistent problem dealing with slightly warmer temperatures in the Spacehab module. A trio of new records were burned into the history books this week during shuttle Columbia's marathon research mission, officials said Thursday. Scientists are hoping the sweet smell of success doesn't turn sour aboard shuttle Columbia. Though temperatures within the Spacehab laboratory inside space shuttle Columbia's cargo bay are running a little higher than normal, NASA missions managers say around-the-clock research is continuing in orbit. Three days into shuttle Columbia's 16-day venture in space the crew is reporting that all is well with their marathon science mission. 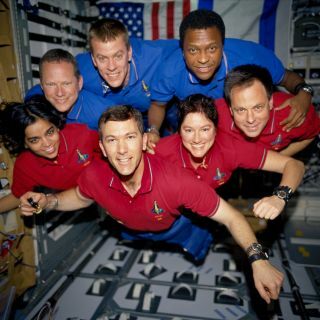 One day after launch into Earth orbit shuttle Columbia and its seven-member flight crew have settled into a routine of around-the-clock research, and already some of the dozens of science experiments are producing results. Shuttle Columbia safely flew into Earth orbit Thursday, the start of a marathon 16-day mission in which seven astronauts will work around the clock in the name of science. Finding profits in space remains as elusive as inventing a cure for the common cold, but if ever those two miracles do occur it's possible that SpaceHab will be where it happens. More than two years after they were assigned, the crew of shuttle Columbia is finally lined up on the field and ready for the opening kickoff Thursday of a 16-day science research mission. The first Israeli astronaut makes this month's shuttle mission a high-profile target, NASA's security chief says, but security hasn't increased tremendously for the Jan.
Add Columbia to the list of NASA's space shuttles suffering from cracks within its main propulsion system plumbing. Astronauts and flight controllers responsible for space shuttle Columbia's upcoming 16-day science research mission said Friday they are ready to go as soon as NASA managers say it's safe to fly. Concern about small cracks recently found in the plumbing of the shuttle fleet's main propulsion system forced NASA on Monday to delay Columbia's next launch "a few weeks."